Join us for an evening of stand-up comedy! 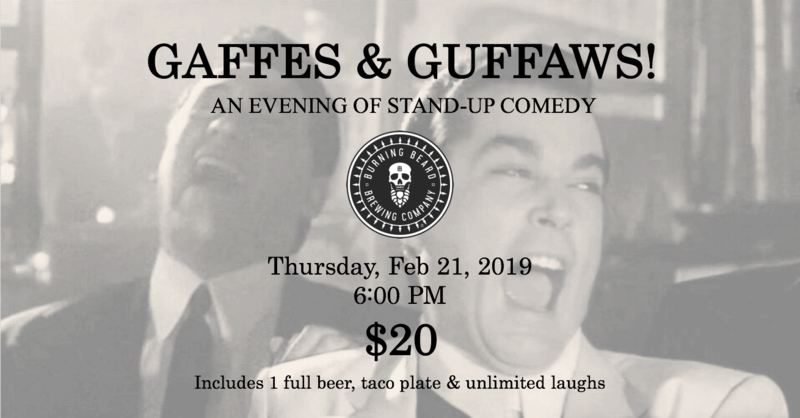 Break up the monotony of your work week with tacos, beer, and raucous laughter as we transform our barrel room into a makeshift comedy club to bring you some of San Diego’s finest standup comics, comedians, and laugh-makers. TACOS & BEER: Tickets include a taco plate from SD Taco Tuesday and one full beer of your choice. Pro Tip: Get your orders in early – doors close at 7:00! TICKETS: $20. Available in the Burning Beard tasting room only. To ensure we don’t over-sell the event, only 30 tickets are available. To check availability, please call (619) 456-9185, or email shannon @ burningbeardbrewing.com. THE FINE PRINT: Doors open at 6:00 PM. Show starts at 7:00 PM. Seats are first-come, first-served. Out of respect for the audience and our esteemed comedians, doors will close at 7:00 with no late admittance permitted. Please ensure food and beer are ordered in accordance with the strict door time. Food and beverage items may not be exchanged, substituted, or redeemed for cash value. 21 & over only.